I am currently with Google, where I work on video coding in the WebRTC open source media stack for internet-based real-time communications. Prior to joining Google, I graduated with a Ph. D. in Electrical Engineering at KTH Royal Institute of Technology in Stockholm, Sweden. My research interests are broadly deep learning, statistical machine learning, and applied mathematical optimization. During my Ph. D. studies, I specifically applied these tools to the problem of base station cooperation for capacity improvement in interference-limited wireless networks. 2017-03-22: Our paper "Optimal Scheduling for Interference Mitigation by Range Information" was accepted into the IEEE Transactions on Mobile Computing. 2016-05-23: I started working at Google, where I will improve the video quality in the WebRTC open source project for internet real-time communications. 2016-04-29: I successfully defended my Ph. D. thesis. 2016-04-08: My Ph. D. thesis "Distributed Coordination in Multiantenna Cellular Networks" is now available for download. The public defense will take place in Kollegiesalen, Brinellvägen 8, KTH Campus, Stockholm at 13:15 on Friday April 29th. 2016-03-29: My paper "Distributed Long-Term Base Station Clustering in Cellular Networks using Coalition Formation" was accepted into the IEEE Transactions on Signal and Information Processing over Networks. 2016-02-23: My paper "Globally Optimal Base Station Clustering in Interference Alignment-Based Multicell Networks" was accepted into the IEEE Signal Processing Letters. 2015-11-09: I was awarded a Best Student Paper Award (2nd Prize) at the Asilomar'15 conference. 2015-11-15: I received a travel award from the IEEE Signal Processing Society for participation at IEEE CAMSAP'15. 2015-10-22: I was awarded a travel scholarship from Gålöstiftelsen for participation at Asilomar'15. 2015-10-16: My paper "Interference Alignment-Aided Base Station Clustering using Coalition Formation" was selected for the Best Student Paper Contest Final at Asilomar'15. 2015-09-11: My paper "Fast-Convergent Distributed Coordinated Precoding for TDD Multicell MIMO Systems" has been accepted to IEEE CAMSAP'15. 2015-07-27: My paper "Interference Alignment-Aided Base Station Clustering using Coalition Formation" has been accepted to Asilomar'15. 2015-05-22: Our paper "Overhead-Aware Distributed CSI Selection in the MIMO Interference Channel" has been accepted to EUSIPCO'15. 2015-04-29: I was awarded a travel scholarship from Styffes stiftelse for participation at EUSIPCO'15. 2014-06-03: I successfully defended my Tech. Lic. 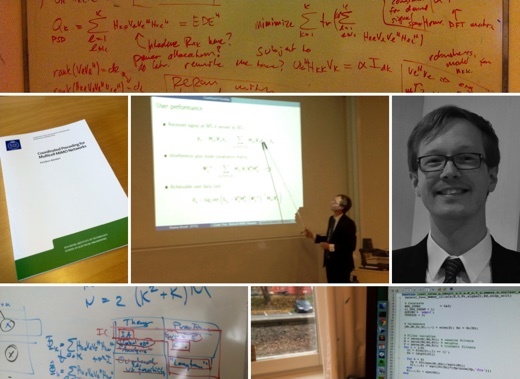 thesis "Coordinated Precoding for Multicell MIMO Networks" at KTH Royal Institute of Technology.